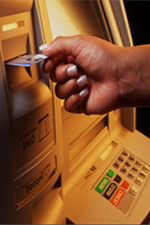 Keep Your ATM Processing Running Profitably. In today’s highly competitive ATM landscape, Financial Institutions need tools that provide you a distinct advantage. For this reason, Case Financial provides ATM processing solutions that help you stand out from your competitors such as convenient real-time reporting tools and profit sharing opportunities that most ATM Processing Companies keep to themselves. Your customers want ATM transactions that get them in and out quickly. Downtime is unacceptable – that’s why Case Financial processes transactions directly through fully redundant data centers to help ensure your ATMs achieve higher and more consistent uptimes. Our ATM Processing Solution directly connects to ATM networks nationwide, eliminating the middlemen or gateways that can bog down transaction times. Additionally, Case Financial spends considerable time and resources on optimizing ATM communication protocols, i.e. TCP/IP, Dial, Frame, ISDN, VSAT, and Wireless, which leads to fewer communication errors and more completed transactions. Cash Management helps to eliminate the hassle of managing your cash load. Real-time notifications when your ATM(s) need replenishing. Real-Time Terminal/Transaction Management from any computer, phone, or tablet. Please visit our Contact page to request more information about ATM Processing.